No, this isn’t like the smaller Psion 5, it has a decent size keyboard, a colour screen but is a lot smaller and lighter than your average Notebook. Battery life can be as high as 30 days. The reason for this is that you can set it to turn off after a minute of inactivity. Or any other timing you choose from “never down” to a second! When you turn on the computer, it loads up the EPOC operating system in a minute fraction of a second. 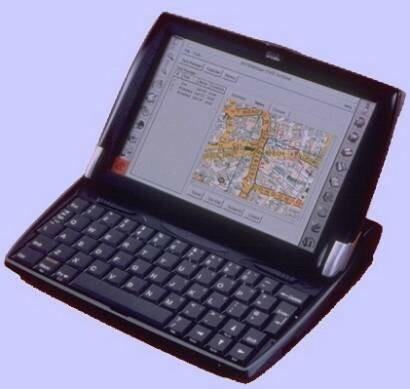 It has a built in Browser, E-Mail Client, Word program, Spreadsheet, Diary, Contact database, calculator, jotter, time zone management, to name but a few. There are hundreds of freeware and shareware programs on the Internet as well. In addition to this, you can have more than one datafile loaded into memory at the same time. For example I have about five word data files and six spreadsheet tables loaded into memory always. I currently have about eight programs and eleven datafiles loaded at any time and if the Netbook turns off, I can turn it back on by tapping one button and it immediately comes to life with the cursor exactly where I left off. With all my programs still loaded. Whereas all the programs are not as bad as Windows programs, you can export the data to the desktop in Windows data formats of your choice. I have just this minute received an e-mail from Psion’s PR people assuring me that the Windows CE version can do this as well. Which must mean they have Windows CE in ROM. So if you are windows orientated, or have those Windows killer applications that you cannot do without, there is now something for you as well. I will stick with my EPOC version, it hasn’t crashed since I bought it. (Yes, Keith B, I know you are MAC fixated). The EPOC machine comes with 32MB or 64MB memory built in and on the left is a slot where you can put a CF Card up to 8GB. On the right hand slot is a PCMCIA slot where you can but a modem, Network card, larger hard disk, Bluetooth or WiFi. Data is handled differently on the Psion and a datafile is a fraction of the size of a Windows data file. I only have a 128MB CF card and store everything on that, plus a backup of the main memory. In addition I have a couple of dozen freeware and shareware programs on it as well. And it is nowhere near full! There are speakers at the bottom for telephone use. Let me explain. If you press the button to dial a call and hold your Netbook over the telephone mouthpiece, your number (tone dialing only) will be dialed. You can change the timings and length of each tone if you need to. If you enter all your phone numbers in the Contact database with the country code, whenever you change your location the number for dialing out to the international system changes automatically. For example, take a number, 020-8123 4567. You would enter it as +44-20-8123 4567. When you dial out from the UK, it would know, by your dial location, and dial 020-8123 4567. If you travelled to France and dialed that number, and you had set your location to France, it would dial 00-44-20-8123 4567. And if you were in the USA and had changed your location to there, it would dial 011-44-8123 4567. And, whilst over there, if you had an American contact listed, it would dial their more localised number. I have had my EPOC Netbook for a two or three years now and must admit, when I go to press events, it’s nice to type out my story on the tube coming home. I would hate to sit with a huge Notebook on my lap! When I go on holiday, it goes with me, and I write up a diary as it happens so I can then withdraw information for various articles as needs be. But, at a thousand pounds, although not cheap, it is worth every penny of the price. Well the EPOC version is anyway!